On 9th July 2016 the Principal, Dr Madhav Deo Saraswat felt proud and privileged to extend a warm welcome to the new parents and students of Classes VI to IX and XI on the first day of the first term. 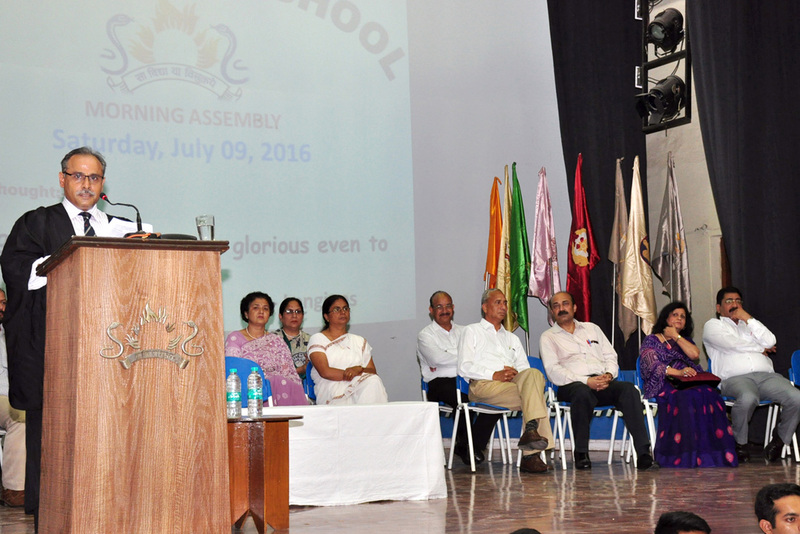 The event was coupled with the investiture ceremony for the new prefectorial board in the Assembly Hall. The Principal, Dr Saraswat reiterated the fact that many parents were aware of the purpose of sending their kids to a residential school. The Principal emphasized the fact that the parents know the calibre and latent potential of their child. Hence they ardently wish it to be nurtured and groomed in such a prestigious school. Dr Saraswat, in his welcome address assured the parents that the teachers, as custodians, will create a conducive environment for each child so that they can imbibe the skills by individual efforts. At the end the Principal motivated the new boys to `wake up, get up and start working hard’ to achieve their cherished dream. Soon after this, the Management team, Dean of various departments, along with the pastoral team were introduced to the parents and new students. Later the parents of the new boys were given e-portal training. The new students and their parents interacted with the faculty members during lunch. Later the boys joined their respective houses in the afternoon after all the formalities were over.